Sterling has stabilised in the past few weeks as uncertainty surrounding the outcome of June’s crucial EU referendum begins to recede. The most recent opinion polls remain finely balanced, although an average of polls since the beginning of April now shows around a 3% lead for the vote to ‘remain’. Bookmakers continue to discount the possibility of a Brexit. We think the best indicator is provided by the Number Cruncher Probability score, which attempts to take into account the biases of each poll. This score now sees the likelihood of Brexit at just over 20%. Brexit is undoubtedly the biggest worry for the Bank of England. The BoE once again voted unanimously to keep interest rates unchanged at their May meeting, defying some expectations that one of the more dovish members could vote for an immediate cut. Growth forecasts for this year and next were revised downwards to 2% and 2.3% respectively, reflecting both weak global conditions and pre-referendum uncertainty. Governor Mark Carney also painted a grim picture of the consequences of a Brexit, claiming that we could expect a sharp fall in Sterling, higher inflation, greater unemployment and lower growth to the point of risking recession. The Bank also attributed around half of Sterling’s 9% depreciation since November to pre-referendum jitters. This uncertainty has begun to filter its way through to domestic economic performance, with the UK economy suffering from a noticeable slowdown since the beginning of the year. Growth in the first quarter slowed to 0.4%, while the latest PMIs have been fairly dismal. 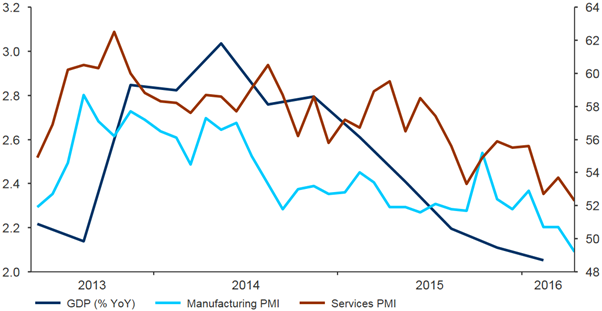 The manufacturing sector contracted in April for the first time in three years, while growth in Britain’s dominant services sector is at its lowest since February 2013 (Figure 1). What does the future hold for GBP? Despite the closeness of the polls, we remain of the opinion that Britain will vote to remain a member of the EU at June’s referendum. Should this be the case, the clearing out of uncertainty would likely result in an immediate Sterling rally and should provide a boost to growth in the second half of the year. This, in our view, would allow the Bank of England to hike interest rates at some point in the fourth quarter of the year. We would expect the Pound to just keep pace with the US Dollar, as the FOMC also tightens monetary policy, and considerably stronger versus the Euro. Get in touch to discuss your Sterling exposure. G4 analysis: Is the ECB set on further monetary easing? What does the future hold for the Euro?